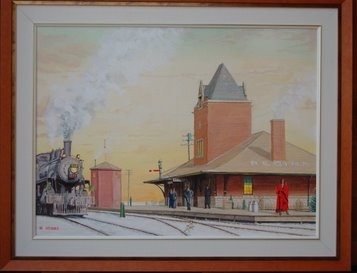 William Hobbs is Canada's most famous train artist. The demand for his paintings was so great, Hobbs was painting nearly every waking moment. It took months to create one single painting. Hobbs studied art in England, Canada, and the U.S. for many years. Each painting was carefully planned and researched with extreme enthusiasm. He painted in layers of paint like the old masters. You won't mistake his snow for cotton candy. It takes a long time to paint snow. Hobbs was obsessed with painting snow and did much of it with a brush with one hair taking the canvas outside and into many different lights to try to get right. You have to see snow for years to understand it. Some paintings even have a little gravel from the real location on the canvas and in the right light, you'll be taken back in time to the wonderful era of trains. 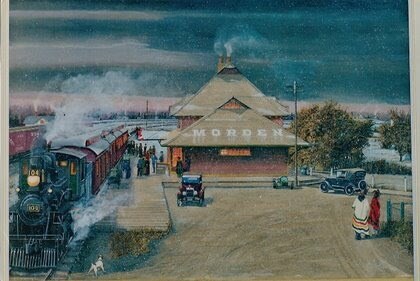 He always hoped you'd enjoy this website with a cup of coffee and time to relax and enjoy the journey into his art where you catch a train and go into the station. All Aboard! The train is about to depart. Please respect Dr. Hobbs hard work and only copy his art for train projects and educational purposes.